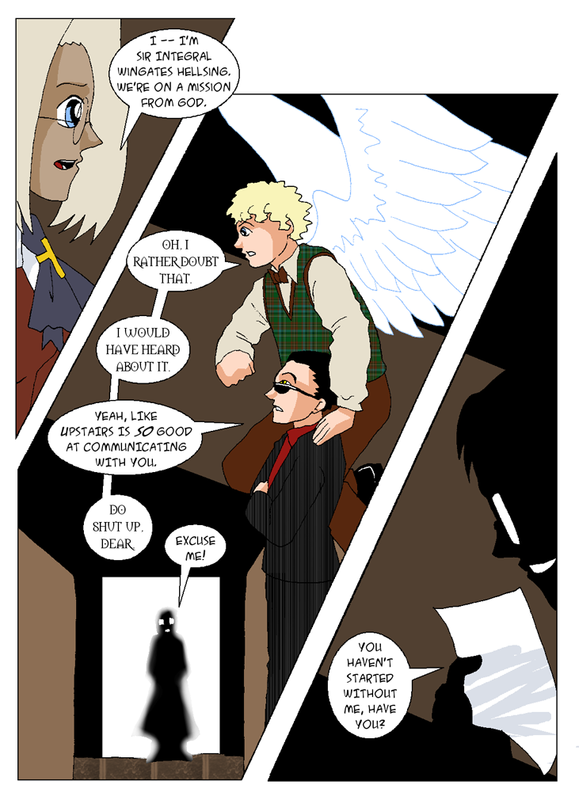 Integra: I — I’m Sir Integral Wingates Hellsing. We’re on a mission from God. Aziraphale: Oh, I rather doubt that. I would have heard about it. Crowley: Yeah, like Upstairs is so good at communicating with you. Aziraphale: Do shut up, dear. Donnie: Excuse me! You haven’t started without me, have you? Integra: Agent Paper! Aziraphale: Dear me! You know these people? Donnie: Hi, Aziraphale! Looks like I’ve arrived just in time! Aziraphale: Donnie–! I don’t want to take the scroll back by force, but I will! Donnie: But Aziraphale, why? You feel it too, don’t you? The emotions of the books? So you know–! The scroll wants to go home! Narration: I’ll probably never know what was going through the angel’s mind in those next few moments. But at last he said: Aziraphale: Donnie…I won’t allow the British Library to have the scroll. Donnie: What–? Aziraphale: But she can hold on to it. Is that an acceptable compromise?